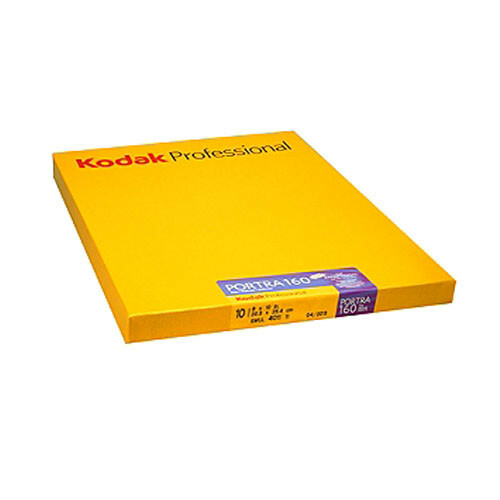 This is a 10 sheet box of 8 x 10" Portra 160 film from Kodak. Portra 160 is a color negative film great for portraits, fashion and commercial shoots. The film delivers superb performance both on-location and in a studio setting. Advanced emulsion technology provides sharp imaging, beautiful neutral skin tones and a finer grain than ever, making for excellent scanned color reproductions. Get great shots with this film, even in challenging light. Targeted Advanced Development Accelerators speed up the film development process. Box Dimensions (LxWxH) 11.05 x 9.0 x 0.85"
8 x 10" Portra 160 Color Film (10 Sheets) is rated 4.9 out of 5 by 8. Rated 5 out of 5 by Keith in Calhoun from Absolutely beautiful The price will make you picky and choosy about when to use it, but the results are well worth the added cost and discrimination. Processing is easy and color rendition is wonderful. I saw slight color shift for very long exposures (e.g. 90 seconds) but it was easily corrected in post-processing. Detail is remarkable and never fails to impress. I found the ISO rating to be spot-on perfect. It scans very well, but let's be honest here, scans won't do justice. Rated 4 out of 5 by Anonymous from still enjoy shooting film I use this film to photograph large scale fine art installations that include a model. I really like the film - it has a great latitude. the only draw back is that it can get really grainy in lower light situations. Rated 5 out of 5 by Anonymous from Great film I use this film pretty consistently for my fine art projects. The color and the film grain are both great. I wish that it came in boxes with a larger amount than just 10 sheets - otherwise I have no complaints. Rated 5 out of 5 by Andrew from 8x10 collor negative film Nice nuanced color redition. Makes flawlwss 20x24 enlarger prints. I believe this is the only 8x10 color negative film that is still available. Rated 5 out of 5 by Takahiro from I will bye again! Super nice film.Please just keep create this large format color negative film! Rated 5 out of 5 by Igor from Top! Top! No this is not, it is daylight balanced.